It’s been a while since I reviewed a coffee from Taylors, not least because I’ve tried so much of their range over the years. 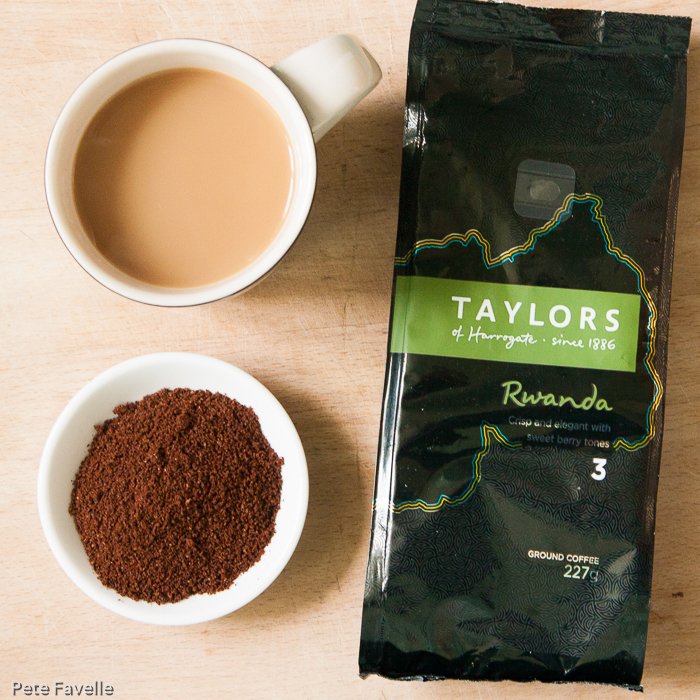 After starting my exploration of their (then) new Origins range with their Indonesia coffee, today it’s the turn of Rwanda – an East African country in the same prime coffee-growing latitudes as better known coffee producers like Kenya and Tanzania. Rwanda is a medium roasted coffee with a wonderfully rich, fruity aroma – dark chocolate-dipped black cherries with just a hint of hot, dry wood underneath. Brewed, the aroma becomes more acidic, but still nicely fruity – most redcurrants than anything more classically citrussy. In the mouth, it’s beautifully balanced; gently sweet, dark fruit and a delicate acidity blending into a surprisingly generous body, creating one of the most drinkable coffees I’ve had for a while. The flavours are subtle, but unlike many ‘lighter’ coffees, never starts to taste weak or watery. 4 stars. With a relatively low strength indicator (Taylors give it a 3 out of 5, although such things are always highly subjective) this isn’t a coffee I would necessarily picked from the shelf, but I’d have been missing out on a wonderful drink if I hadn’t. A lesson, perhaps, not to be too easily led by such packaging.